Meenan’s Cove Park (199 Model Farm Road) is our most frequently visited park, offering a variety of amenities. The public beach is one of the most popular beaches in the Kennebecasis Valley with lifeguards on duty for the summer months. The park also has a green area and playground for small children and a walking trail. The Meenan’s Cove Beach House, located on the water, is available for bookings and has a large deck, kitchen facilities, washrooms and propane fireplace. If you are interested in outdoor picnics and barbeques, several shelters and pits are located throughout the park and available to book. Used by Quispamsis and surrounding areas residence, the Meenan’s Cove Boat Launch is a perfect location for the recreational boater to launch their boat for the day. No overnight docking allowed at this location, day use only. Meenan’s Cove Park also has special boat trailer parking spaces for a vehicle and trailer. The Meenan’s Cove Covered Bridge is a popular location for taking photos. Whether it be pictures for a wedding, graduation or family photos. The covered bridge comes to life in the spring and summer and is well maintained and landscaped by the Parks & Facilities Department. 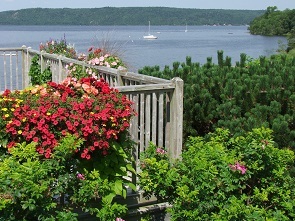 The Meenan’s Cove Arbour is located at the entrance of Meenan’s Cove Park. The shady wooden arbour is a beautiful landmark that is home to a variety of plants, vines and climbing trees. Such as grape vines, creeping thyme, hyacinth & astilbee just to name a few. This is a great location for family & company picnics. The arbour is also equipped with picnic table and charcoal bbq’s for public use.